Sites like Kickstarter and Indiegogo help entrepreneurs get their products funded and shipped to backers — but what about the process of where these ideas come from? Confidence in a product or idea is key, and sometimes we need that extra nudge and seal of approval. That’s what GoDaddy is venturing into with a new app called Flare. You heard right — GoDaddy, the company that offers domains and hosts websites for many small businesses — has developed an app that’s part Shark Tank, part idea journal. The company says it conducted its own survey, and found that 67 percent of respondents say they have come up with a concept for a business, service, or product, but only 15 percent have acted on it. GoDaddy’s answer is Flare. Flare lets you quickly post any ideas that come to your mind for a product or service, and if you receive 10 or more “loves” within 24 hours, you’ll unlock the ability to ask questions to the community to get further feedback about the specifics of your idea. When you open Flare, you’ll see three ideas on your home page. You can only interact with three ideas at a time from the Flare community. If something interests you, like a “Coffee machine in Uber vehicles,” you can tap on it to glean more information and like it. You can also swipe right to snooze the idea for later, and it will show up again if the idea becomes popular. Your Flare is localized to show you ideas near you, but it’s not limited based on where you are. 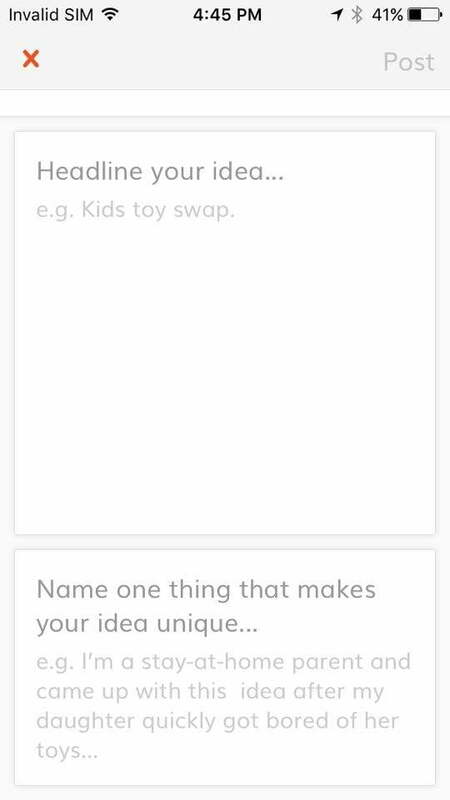 If you’re not interested, you can swipe left to skip it, and the feed will bring up a new idea from the community. The process is meant to be simple — and so is submitting your own idea. Once you fill in a headline, choose an image from the Flickr API, write an example that makes your idea unique, along with a short description, and you’re good to go. You can share ideas on social media, and after that, all you have to do is wait for the Flare community to decide whether or not your idea is good. If your idea surpasses 10 likes in 24 hours, you get to ask the community questions that would further improve your idea. The company is still thinking about how it can help these entrepreneurs see their ideas come to fruition — for example, you can “pledge” to buy a product if an idea surpasses 10 likes to show your support. But as of right now, Flare is a simple way to get your ideas off the ground with some social backing. Flare was created by Rene Reinsberg, who is the vice president of GoDaddy’s Emerging Products division. Reinsberg told Digital Trends the company wanted to build a tool to give small businesses and entrepreneurs feedback for ideas. “We definitely want to encourage people to put silly ideas in because sometimes there’s something good within a silly idea,” Reinsberg said. And the platform doesn’t have to extend to businesses or entrepreneurs — anyone can use Flare. Reinsberg said there has been interest from companies and organizations to have a Flare for their own employees or members, and it could be something we see in a later update. Either way, the GoDaddy is exploring what Flare can be for now by first trying to build a solid user base. Flare is available for iOS right now, and an Android version will be released in June.